Known by most of us as Peggy she was a woman with a heart of gold. Always there with a cake or gift for almost every person she knew or every occasion being celebrated she was a "gift that really kept on giving" to "infinity and beyond". I got to know Peggy personally and loved to laugh with her, maybe even tease her a bit, in a loving way of course. 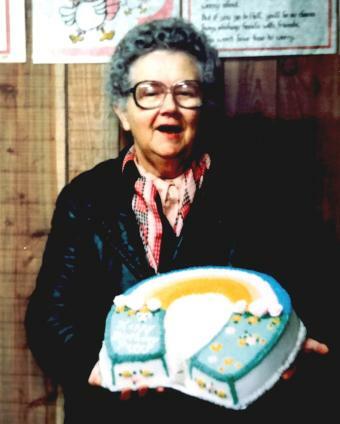 She was a former Trenton citizen of the year and winner of the 1989 Val Carswell volunteer service award. Peggy died at age 87 and is still in my heart, remembered for her great sense of humor and spirit always ready to jump into the theme of the day forever getting involved in community events a lifelong resident of Trenton and was a fixture throughout Trenton before moving to Applefest Lodge in Brighton. An avid hockey fan Peggy was devoted to the NHL Chicago Blackhawks and is most likely still cheering them on from heaven. Another special recognition she received includes an honor by Dr. Doug Galt MPP for Northumberland in 1999 for the international year of the older person from Trenton Scouts and St Andrew's Presbyterian Church as well as being an honorary member of the "Keenager" Seniors 925. I was so happy that Peggy was recognized and loved by the community as much as she was loved by those who knew her well. She was an "Earth Angel" while here and most likely is already an Angel in Heaven. Yes, I am pretty sure that that ringing bell you heard a few years ago was Peggy getting her wings. Thank YOU Peggy for touching my life, the life of my family and so many others!! !